The most advanced athletic shoe repair formula ever developed! Shoe GOO repairs worn shoes and prevents premature wear. Easy to Use, dries overnight. Shoe GOO is an excellent adhesive, which can be used with a wide variety of materials (shoe soles, camping/fishing gear, etc.). 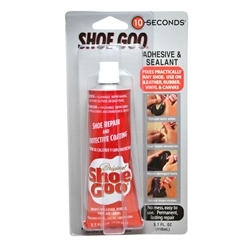 Shoe GOO is actually rubber in a tube, with solvents added to make it more applicable for hundreds of uses. Once cured, Shoe GOO is an extremely tough, resilient rubber surpassing the strength of most adhesives. Is highly flexible and can be used to create a non-slip surface, or provide an excellent waterproofing cover. 3.7 fl. oz. tube. 1. Use to reattach soles to shoes. 2. Reattach rubber/leather parts to shoes. 3. Patch holes or repair cracks in soles. 4. Patch holes or rips in fishing waders. 5. Patch holes or rips in tents. 6. Patch holes or rips in sports bags, suitcases. 7. Reattach tiles to walls. 8. Attach signs to walls, telephone poles, cars, other signs. 9. Hang hooks (plastic, metal or wood) to walls (concrete, brick, wallpaper, wood). 10. Reattach handles to drawers, desks, cabinets, sewing boxes, etc. 11. Reattach loose rubber packing around windows at home or office. 12. Repair broken pottery, vases, decorations, lamps etc. 13. Reattach plastic molding on bottom of wallpaper. 14. Repair rips and tears in vacuum hose. 15. Repair broken toys, model cars and airplanes, TV, game machines. 16. Repair broken dolls, dollhouses. 17. Coat inside of radio-controlled cars, planes, and ships to waterproof and protect against breakage from collision. 18. Reattach handles to purses, shopping bags. 19. Coat handle grips on bicycles. 20. Repair ripped or torn bicycle seats. 21. Repair cracks in bicycle helmets. 22. Use to build up worn down training wheels. 23. Repair cracked plastic or rubber fenders on bicycles. 24. Repair cracked concrete walls or fences. 25. Repair wooden fences, gates, garden trellises. 26. Reattach tiles around swimming pool or KOI ponds. 27. Repair ripped or torn golf bags. 28. Repair ripped or torn bowling ball bags. 29. Repair ripped or torn baseball bat bags. 30. Repair cracked or chipped canoes. Great for waterproofing! 31. Repair or reinforce rubber bindings on water skis. 32. Repair or fill in cracks around glass on motorboats. 33. Repair torn or worn covers on chairs on motorboats. 34. Repair loose fins on surfboards. 35. Create a non-slip surface on surfboards. 36. Repair ripped or torn diving fins. 37. Repair ripped straps on diving masks. 38. Strengthen supports for oxygen tanks for scuba diving. 39. Use to make walking and hiking shoes non-slip. 40. Use to make non-slip foot on gas stove stands for camping. 41. Use to strengthen or reinforce fishing rods. 42. Use to strengthen or reinforce fishing rod cases. 43. Use to strengthen or repair fishing tackle boxes. 44. Use to glue flies for fly-fishing. 45. Use to reattach loose rubber pads on Ping-Pong rackets. 46. Use to build and repair pockets and edges of billiard tables. 47. Use to repair rubber end of billiard cues. 48. Use to repair torn motorcycle handlebar grips. 49. Use to repair torn motorcycle seats. 50. Use to repair torn wrestling mats.